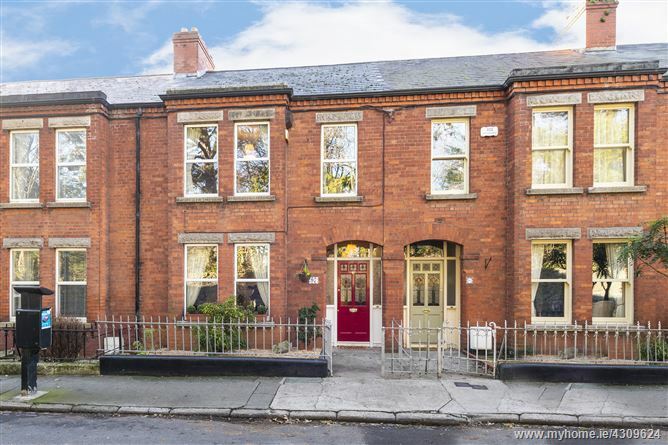 MOVEHOME ESTATE AGENTS ... are honoured to offer a truly delightful 3/4 bedroom period residence that sits with pride and grace, on a private stretch of one of the most desireable roads in this established area . No. 97 Church Avenue is a spacious family home of 125 m² / 1345 ft² with handsome proportions and many elegant features throughout, and this property also benefits from one of the most private rear gardens on this popular road. The garden is approx 45ft long and 20ft wide, which gives the new owners ample room to extend the original structure in style or even build an outhouse/studio/playroom to the very rear of the garden, which has pedestrian access to the lane. This is without doubt one of the most wonderfully presented homes to come to the market this year and the care by the current owners results in the creation of a captivating and exemplary interior, that one would expect to see in an interior magazine. The immensely stylish interior greatly compliments the original design and viewing is the only way to appreciate what this home has to offer. The accommodation comprises a welcoming entrance hallway with ample storage facilities and a seperate cloakroom. Two large interconnecting reception rooms are located off the main hall, with high 2.8m ceilings, period fireplaces and the original quality wooden flooring. The front living room has a prominent bay style window that enjoys views of the avenue and discreet double doors lead to the rear dining room. This spacious room enjoys all its original features and has a glass door that lead out to the mature and private rear garden. The kitchen/breakfast room to the rear is a few steps down the main hall and enjoys pedestrian access to the rear garden which it overlooks. The Shaker style kitchen has ample space for the growing family and is flooded with natural light throughout the day.